Click on the cover for more information or to order copies. The Salvagers series is set in the distant future, where habitable planets are connected through intergalactic trade. Systems with larger trade corporations are thriving, while planets with little shipping resources turn to piracy and small guerilla military units to pillage trade ships. This forces the larger trade companies to hire private security contractors for protection. With clashes between pirates, private security forces, and the military, along with the occassional, unpredictable natural space phenomena, outerspace has become a very violent place. Incapacitated ships, or "WRECKS", sometimes carrying precious cargo, are often left abondoned, in the wake of this violence. Salvagers are licensed crews what are commissioned by governments, empires, and corporations to remove the wrecks. Writer Robert Salley did a masterful job of developing an original and unique story, exploring a previously unexplored element of space science fiction. We often see space conflict from the perspective of the intergalactic freedom fighters, but I can not recall ever reading a story told from the salvage crew's perspective. This original take on space science fiction is actually quite refreshing. The story focuses on a four member salvage crew, featuring Bill Roenick (the captain of the crew), Teagan (the purple-haired vixen), Ty'r (the Tipernian muscle man), and Brigby (the lizard-like Graxon). Bill and Teagan appear to have a developing romance, while Ty'r and Brigby seem to have a big brother, little brother relationship. Its hard to tell if Ty'r actually likes Brigby (or anyone else for that matter), but he does have a strong sense of loyalty to his teammates, and will quickly come to their aid when needed. Brigby, whom I found to be the most interesting character, is the light-hearted, trouble-maker of the crew, who seems to often find himself in dangerous situations that his teammates have to bail him out of. The diverse personalities of the team make for an interesting team dynamic. As you can probably tell from the cover art, the artwork in the Salvagers series is top-notch. While I liked the artwork in the first issue, it is quite evident that the artist, George Acevedo, hit his stride with issue number two. The images in the panels in issue number two display a finer level of detail, and higher level of polish than in the first issue. The colorist, DeSika, also showed progression, as the colors really popped in issue two. If the visuals continue to trend in this direction, I can't wait to see what issue three will look like. Like the visuals, the story also began to pick up with issue number two. We not only get a little more insight into the characters' individual personalities and interpersonal relationships, but we also get the backstory depicting the circumstances which have led to their current predicament. That being said, I would have preferred a smoother transition from issue one to issue two. Issue number one ended with a great cliff hanger. Instead of picking up at that point, and then getting into the backstory, issue two immediately starts with the backstory, before picking up where issue one ended. The backstory took a while to develop, so a little of the momentum built with the climax of issue number one was taken away. This was a little disorientating to me. Perhaps a panel or two, or a written synopsis of issue one, on the first page(s) of issue number two would have sufficed to bring readers up to speed on previous developments, before getting into the backstory. Of course, I am completely nitpicking at this point, as this did not take away from a very pleasurable reading experience for me. I thoroughly enjoyed reading the first two issues of the Salvagers series. This is a really good series with the potential to be epic. I can easily see this series being made into a live action feature film or television series. 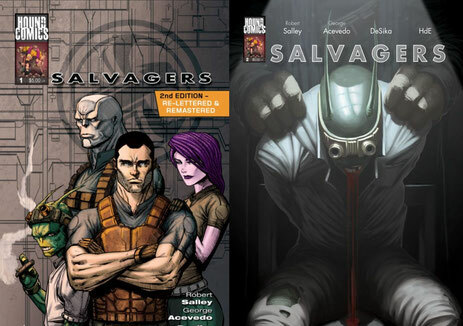 If you are in the mood for a good sci-fi comic, then the Salvagers series is definitely worth a read. Do not hesitate to get your copies! + Unique Concept for a Sci-Fi Story, Great (Potentially Epic) Story is Developing, Interesting Characters with a Great Team Dynamic, Great Artwork (Especially in Issue #2). - Needed a Smoother Transition from Issue #1 to #2.